Selako is a language spoken by over 100,000 people in the far west of the island of Borneo, mostly in Indonesia, but also in Malaysia. (It is also called Selako Dayak, Salakau, Silakau, and Selakau.) 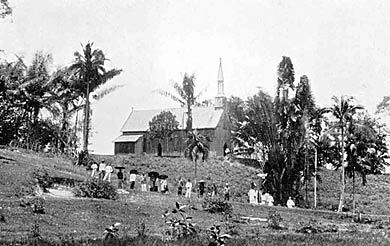 Christian missionary work among Selako-speaking people began on Borneo at Lundu in what was then the British protectorate of Sarawak. (Sarawak was until WW II ruled by a dynasty of English rajahs). Selako is now spoken in the Diocese of Kuching and the Diocese of West Malaysia in the Province of the Anglican Church in South East Asia. For more information on the history of Anglicanism in Sarawak/Borneo, see the dedicated Project Canterbury directory on this area. 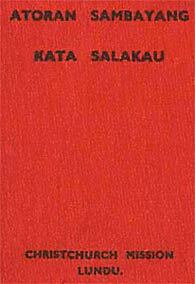 This translation of portions of the Book of Common Prayer into Selako is not dated, but the back cover of this 41-page booklet indicates that it was printed in Kuching, Sarawak at the Vanguard Press, Ltd. The bishop named in the intercessory prayers is Basil Colby Roberts (1887-1947, Bishop of Singapore 1927-1941), so this allows the possibility of dating its publication between 1927 and 1941. The terminology used in this translation reflects a strong Anglo-Catholic expression of Anglicanism, given the use of terms such as "Mass" and "Sacrament of Penance" not included in the Book of Common Prayer. This book appears to be a translation of the 1928 Proposed BCP, with a number of abbreviations and a few modifications. Neither this book, nor any BCP in the Selako language, is listed in David Griffiths' Bibliography of the Book of Common Prayer. 1. Atoran Sambayang Mass. Holy Communion. 4. Sakramen Baptisa Ka Orang Kenik. Infant Baptism. 5. Sakramen Baptisa Ka Orang Tuha. Adult Baptism. 6. Sambayang Gasa Masok Ka Orang Jaji Katakumin. Admission of Catechumens. 7. Sakramen Ngampuni Kasalahan. Sacrament of Penance. 8. Sambayang Mari Puji Kamie Ambini Udah Beranak. Woman’s Thanksgiving after Childbirth. 9. Sambayang Barakat Ka Rumah. Blessing of a House. Thanks to Richard Mammana, who provided and transcribed the text.